Minimalism isn't just a trend, it's a lifestyle. And whether you like simple design or not, your bedroom should be a sanctuary, and a pared-back approach is a surefire way to turn it into one. With sleep helping us stay in good health, could a less cluttered room be the answer to a perfect night of slumber? 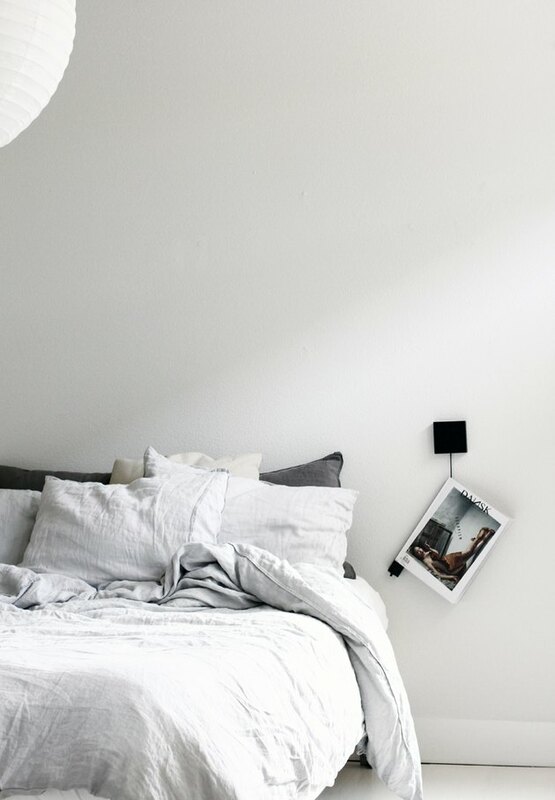 Here are nine minimalist bedroom ideas that are picture-perfect proof that less is more — plus, our top tips for embracing a minimal aesthetic. 1. Create a calming atmosphere. Bedrooms should be a place to relax, free from technology, noise, and clutter. When designing your room, think about what makes you feel rested and incorporate those things. 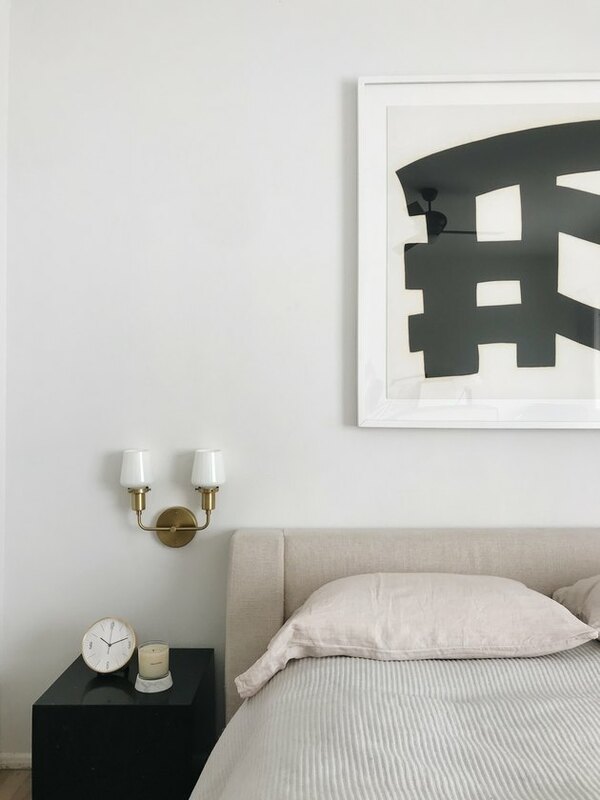 Take style notes from Jennifer of the design blog A Merry Mishap, who has made her bedroom the ideal place to chill out with neutral colors, cozy linen, and a magazine holder for her current reading material. It's easy for a minimalist bedroom idea to come across as stark, so it's important that you use colors with a warm tint if you still want the look to be inviting. Neutrals such as white, gray, and beige will create a clean appearance, while taupes, pinks, and sandy yellows will bring a sense of comfort. 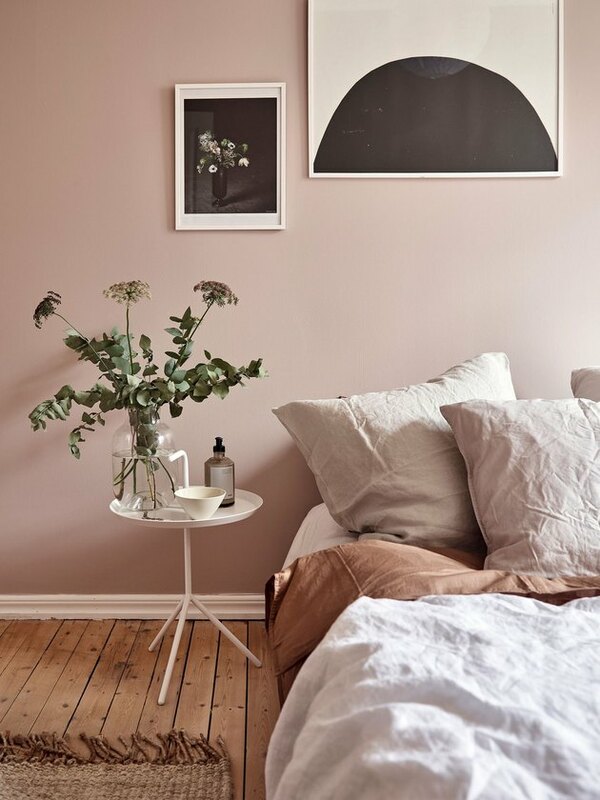 Take note of the soft dusty pink adorning the walls of this bedroom, adding character and personality to the minimal setup. 3. Opt for a platform bed. Any minimalist bedroom idea should include furniture that is lightweight and simple in style; nothing too ornate. 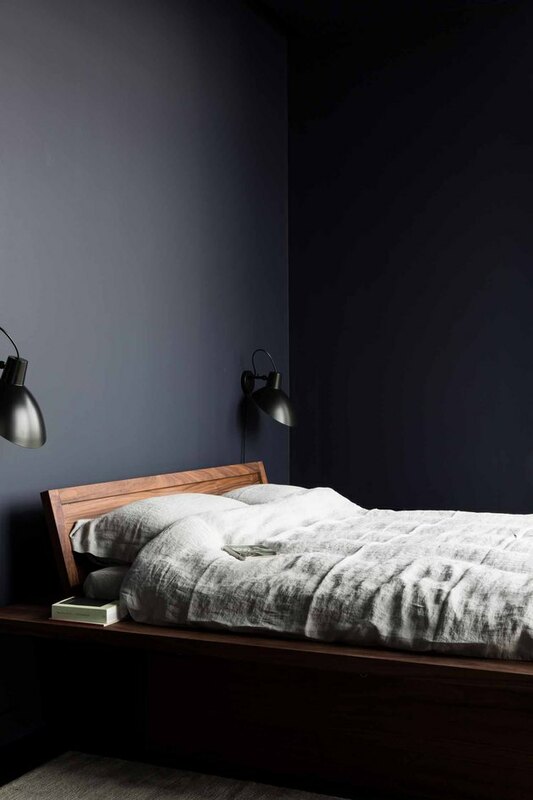 The platform bed in this interior scheme designed by Cereal magazine for London-based estate agents Aucoot appears to almost float amongst a sea of dark blue walls. The rest of the design has been kept fuss-free and structured to avoid any distractions from the land of nod. Sweet dreams are made of this. Minimalist style champions a decluttered living space, and your styling should encompass this relaxed approach. Choose a few statement pieces and leave it at that. In this case, interior stylist Elisabeth Heier used a sculptural table with a beige marble top as her accent piece, finishing the rest of the room with a brass lamp, twigs in a vase, and beige linen sheets. 5. Choose one statement piece of art. 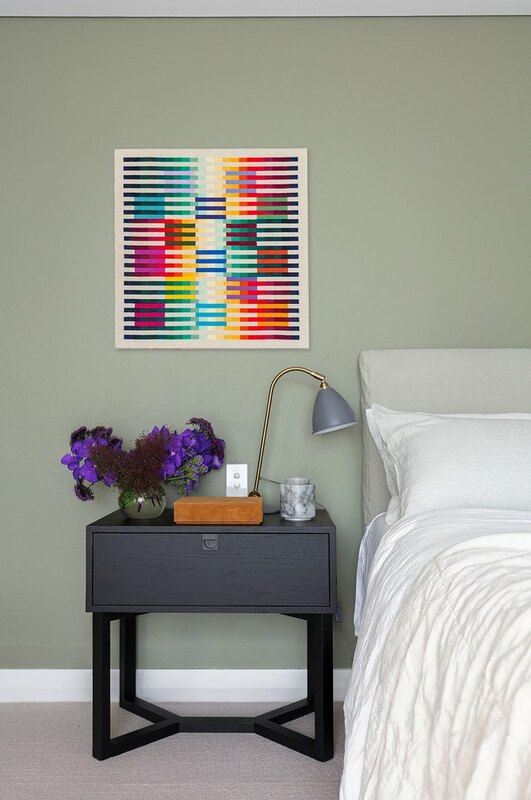 Bold colors aren't discounted entirely from a minimalist bedroom idea, and this haven from Arent and Pyke shows an entirely different way to create a timeless and clutter-free design. The pop of color via this statement piece of art shows off the homeowner's personality and perfectly complements the sage wall color. 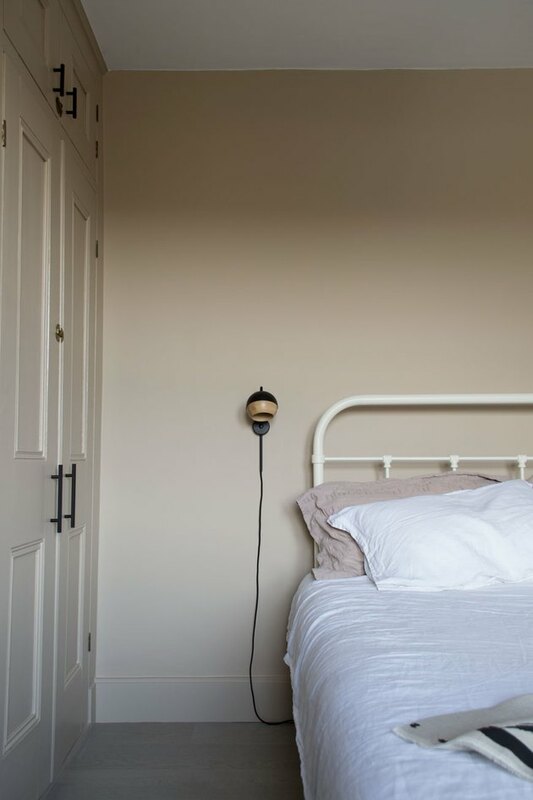 British blogger Tiffany of Curate and Display has even discarded the bedside tables in her minimal bedroom, instead focusing on simple corded wall lights by crafted by the Pederjessen Design Studio for Mater. Adjustable wall sconces are ideal for directing light for different tasks and will make your space both functional and clutter-free. 7. Add layers of texture. 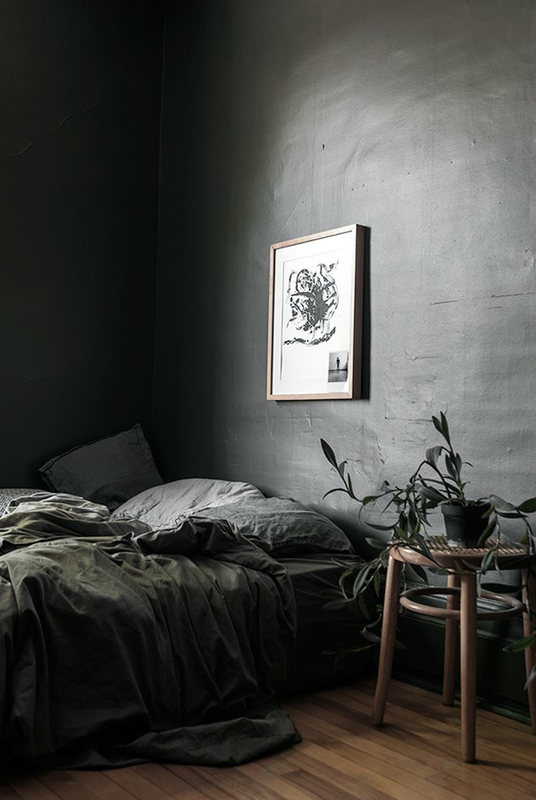 If you're looking for a dark and moody minimalist bedroom idea, you should consider layering other textures in the room to add interest. This dramatic gray refuge belonging to blogger Bianca Wippe features natural elements such as linen, unpainted wood, and one statement plant to bring just the right amount of accessorizing. 8. Make it cozy with accessories. It's the small things that make all the difference, right? 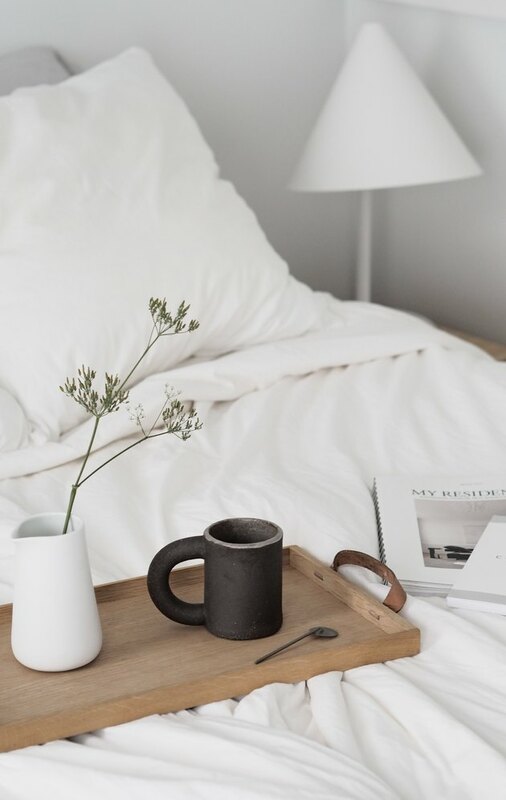 Make your bedroom Sunday morning-ready just like minimalist expert Hannah Trickett did with fresh white linens, a serving tray complete with a ceramic mug, and your favorite magazine. 9. Balance out clean lines. 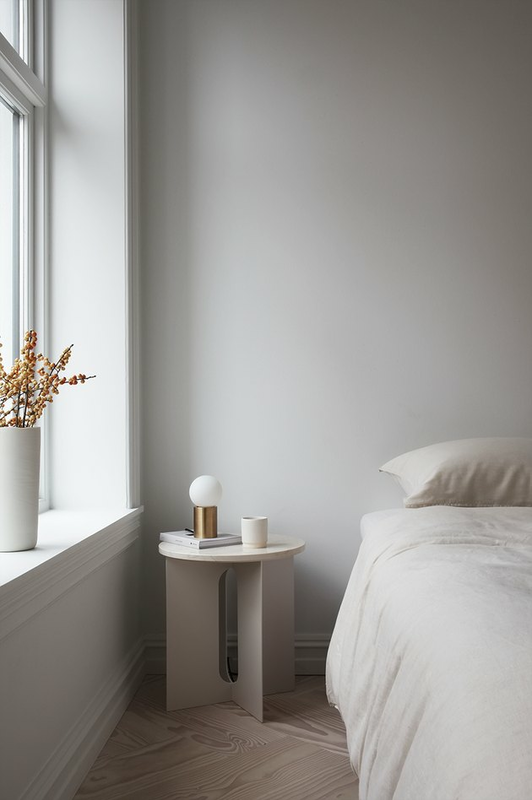 Clean lines are key to a minimalist bedroom idea, but to avoid the design scheme becoming too austere, it's important to balance them out with soft furnishings and a hint of pattern. This upholstered bed belonging to Anne Sage is clean and contemporary in shape, but also sophisticated and understated, thanks to tight tailoring and the neutral color and texture. We're tempted to jump right in. Emma Jane Palin is a multi-award-winning blogger and freelance writer with a penchant for design and interiors.